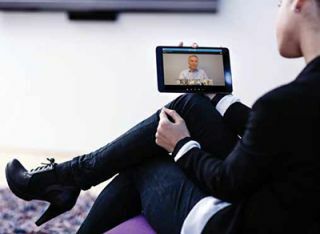 Pexip Infinity software enables high definition video conferencing on mobile devices, and works seamlessly with Microsoft Lync to provide an immersive conferencing experience on a corporate level. Lync users can seamlessly connect any videoconference meeting on any room or corporate infrastructure.The cloud, in combination with the proliferation of mobile computational devices, has been transformational, especially in the business community. Where once a presenter would have had to fumble for a cable in order to get his or her laptop connected to the conference room display, there is now a growing expectation that any device should be able to connect easily and seamlessly—and there are companies meeting, and even exceeding, those expectations using cloud technology. “I used to be so cynical about the word ‘the cloud.’ To me it was just another word for the internet. But it’s actually more nuanced than that, because the internet is a technology and an infrastructure, but the cloud is more of a social and use statement,” said Christopher Jaynes, founder and CTO of Mersive. The computer-science-based company, initially funded by the National Science Foundation and other governmental entities, is leveraging the cloud to move visual collaboration from hardware to software solutions, such as its Solstice and Sol display technologies. “It has to do with the pervasive belief that I have access to any data or application that is on the internet. It’s a social convention, almost, that we’ve adopted,” added Jaynes. “Google is already completely in the cloud and always has been. But now Microsoft is there and Office is all cloud-based, and there are all these neat file transfer things we use every day, like Dropbox, Google Drive, and iCloud,” commented Lee Dodson, president and COO for the Americas at Arrive Systems. The company offers hardware and software platforms enabling unified communications and collaboration as well as networked media solutions. “All this cabling and video switching gear is legacy, and has a particular shelf life,” agreed Jaynes. “If you compute the amount of available bandwidth via wireless technologies over time, and the commercial technologies, what’s required to move an HD signal, pretty soon you don’t have to have that video cable anymore. Pexip, a company founded by Tandberg and Cisco veterans, has identified what Simen Teigre, co-founder and CEO, refers to as the “five universal pillars” on which this transition from a hardware-based to a virtualized software-based conferencing and collaborative environment will be based. The company, which started in summer 2012, just announced the general availability of Pexip Infinity, a scalable software platform that provides personal meeting rooms for any number of users on video, voice, and mobile. Second, “All of the conference platforms out there have typically been hardware-based, custom developed DSP and FPGA-based hardware platforms, and there’s no reason for that anymore. Actually, it’s holding us back, both from a cost and complexity standpoint,” he said. and people don’t want to use them that way anymore,” noted Lee Dodson of Arrive Systems, provider of the FacePoint collaboration media system, above.Systems designers and integrators are—hopefully, for their continued survival—already well aware of the accelerating convergence of AV and IT. Where do they fit into a landscape where conference room collaboration and videoconferencing are almost pure IT? For example, Mersive’s Solstice will soon feature a centralized management dashboard. “The IT manager and AV consultant can sit at that dashboard and configure hundreds of displays, check analytics, and things like that,” he said. Steve Harvey (sharvey.prosound@gmail.com) has been west coast editor for Pro Sound News since 2000 and also contributes to TV Technology, Pro Audio Review, and other NewBay titles.